Sherlock. Seria 3, odc. 3, Jego ostatnia przysięga [Film] / reż. Jeremy Lovering, Colm McCarthy, Nick Hurran ; scen. 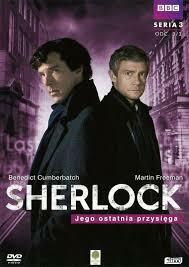 Mark Gattis, Steven Moffat and Steve Thompson ; występują Benedict Cumberbatch, Martin Freeman [i in.]. - Warszawa : Best Film, 2014.